What Is Quidding In Horses And What Can You Do About It? What Is Quidding And What Can You Do About It? Horses with sound teeth can break up and grind feed, grass and hay easily and efficiently. This enables them to digest food well and make the best use of the nutrients it contains. When a horse has broken, missing, loose or diseased teeth, it can cause a chewing malfunction called “quidding”. In this article we describe quidding in horses and provide good advice to help you deal with and resolve this problem. Read on to learn more. Have you noticed that your hose is dropping a lot of feed on the ground or spitting out slimy balls of hay? This is quidding, and it is an indication that your horse is experiencing pain while chewing. 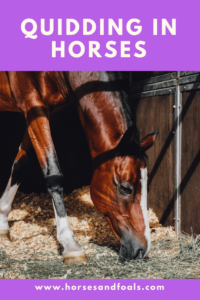 Horses of all ages can be affected by these problems, but older horses are especially prone to dental problems, especially loose teeth or lost teeth. Luckily, there are a couple of things you can do to improve or completely resolve this problem. Regular equine dental care is key to preventing and treating quidding. Have your vet perform a dental exam at least once a year even if your horse does not seem to have trouble chewing. If your horse has sharp spots or uneven teeth, having the teeth floated will even them up and provide a smooth chewing surface. Adjust your horse’s diet. If your horse is quidding due to loose or missing teeth, changing to feed that is easier to chew can help. Select a nutrient-rich feed to provide the most nourishment in the amount your horse is able to chew and swallow. Hay pellets make a good alternative forage for older horses or horses who are suffering from chronic dental problems. These pellets are made of high quality, pulverized hay so they crumble readily and are easy for horses to swallow even without a lot of chewing. Senior horse feed is typically high in nutrients, easy to chew and easy to digest. It usually contains vegetable oil and/or rice bran for high quality added fat. Additionally, this type of feed is high in fiber in the form of beet pulp or soybean hulls. All of these ingredients are easy to digest and provide top nutrition that is suitable for horses of any age. Added vegetable oil can help soften pellets and add more calories to your horse’s diet. Use canola, rice, soybean or corn oil if your horse has lost weight due to inability to chew. 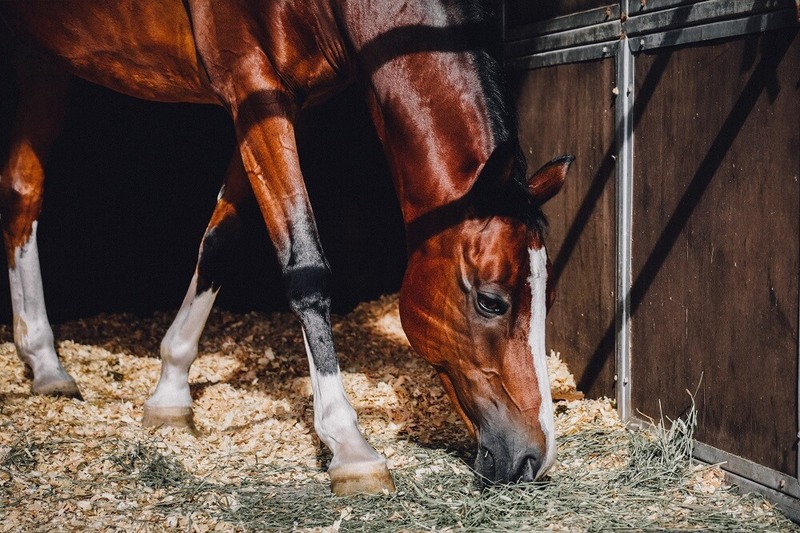 If your horse has trouble chewing pellets, you can make a mash by adding warm water to soften the pellets into crumbles. Stir and fluff the mixture before offering it as this makes it easier for your horse to pick it up with his lips. Even if your horse is getting most of his nutrition from pelleted hay and feed, you should continue to offer long stem hay just to provide the activity of chewing. This is a calming activity and keeps your horse occupied. Using a slow feed hay net adds challenge and reduces waste. On the surface, quidding causes a tremendous waste of money and resources for you. If your horse is spitting more food on the ground than he is swallowing, that’s just waste. In terms of health, quidding is a serious matter because it indicates that your horse is experiencing dental problems and pain. Additionally, it leads to lack of nutrition, reduced condition and increased veterinary expenses. That’s why, when you notice your horse has lost weight or is quidding, you should have your vet perform a complete oral exam right away. Quidding – Pain, Tongue Movement, Bad Hay Or Broken Tooth? as there isn’t other “horsemen and woman” in the area could you possibly direct me in the right direction? Equine dentist,.Vet. Need on-site service.